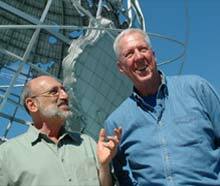 TOP: David and Barry discuss the history of Queens at the Unisphere in Flushing Meadows Corona Park. Receive A WALK THROUGH QUEENS on VHS or DVD when you pledge now! "Two-and-a-quarter million people live here, and almost half of them were not born in the United States. They're living the American dream," says David Hartman in his introduction to the latest video walking tour from Thirteen/WNET New York. "Here" is Queens, the most ethnically diverse county in the United States, where virtually every nation on the planet is represented. A WALK THROUGH QUEENS WITH DAVID HARTMAN AND HISTORIAN BARRY LEWIS, premiering Monday, December 6 at 8 p.m. (E.T.) on Thirteen, takes the series' host and tour guide on a symbolic trip around the world, from Astoria's "Little Middle East" to Flushing's "Little Asia" to Jamaica's bustling African-American/Caribbean/Latino shopping district. As they traverse the City's largest borough, Hartman and Lewis find a vast tapestry of cultural and geographic communities, each with its own character and history. They visit the Louis Armstrong House in Corona, the unpretentious two-story clapboard where "Satchmo" lived from 1943 until his death in 1971, and the Isamu Noguchi Garden Museum, a tranquil outpost of art amid the warehouses of Long Island City. At the Friends Meeting House in Flushing, built in 1694, they discuss the architecture of New York City's oldest religious building and recount the Quakers' struggle for religious freedom under Governor Peter Stuyvesant. A tour of the Steinway & Sons piano factory on Astoria Boulevard demonstrates more than 130 years of legendary craftsmanship and reveals how the immigrant Steinway family transformed a country village into a company town, complete with its own housing, post office, church, trolley system, amusement park, beer garden, and library. The Today Show weatherman Al Roker shares memories of his youth in St. Alban's, and Hartman and Lewis chat with Queens Poet Laureate Ishle Park about growing up in Whitestone. Other stops include Lewis' childhood neighborhood of Woodhaven; Sunnyside Gardens, originally developed as an experimental utopia for working-class families; the 76,000-square-foot Flushing branch of the Queens Borough Public Library; and landmarks from the enormously influential -- and controversial -- legacy of Robert Moses, including the Astoria Pool, Flushing Meadows-Corona Park, and the Triborough Bridge. A WALK THROUGH QUEENS is Hartman and Lewis' ninth Walking Tour program. The series, one of the most popular in Thirteen's local programming line-up, launched in 1998 with A WALK DOWN 42ND STREET, followed by explorations of Broadway, Harlem, Brooklyn, Greenwich Village, and Central Park, as well Newark and Hoboken across the Hudson. A WALK THROUGH QUEENS WITH DAVID HARTMAN AND HISTORIAN BARRY LEWIS is a production of Thirteen/WNET New York. James Nicoloro is producer. John DeNatale is executive producer. Tammy Robinson, Thirteen's vice president for programming, is executive in charge. Major funding for A WALK THROUGH QUEENS was made possible by a grant from Con Edison and the Jane Henson Foundation. Additional funding was provided by the Korean American Friends of Thirteen, the Samuel J. and Ethel LeFrak Charitable Foundation, Inc. and the New York Community Family of Banks. Thirteen/WNET New York is one of the key program providers for public television, bringing such acclaimed series as Nature, Great Performances, American Masters, Charlie Rose, Religion & Ethics NewsWeekly, Wide Angle, Stage on Screen, Secrets of the Dead, and Cyberchase � as well as the work of Bill Moyers � to audiences nationwide. As the flagship public broadcaster in the New York, New Jersey and Connecticut metro area, Thirteen reaches millions of viewers each week, airing the best of American public television along with its own local productions such as The Ethnic Heritage Specials, The Thirteen Walking Tours, New York Voices, and Reel New York. With educational and community outreach projects that extend the impact of its television productions, Thirteen takes television "out of the box." And as broadcast and digital media converge, Thirteen is blazing trails in the creation of Web sites, enhanced television, CD-ROMs, DVD-ROMs, educational software, and other cutting-edge media products. More information about Thirteen can be found at: www.thirteen.org.